To pass on an environment characterised by clean air and fuel-efficient/zero emissions vehicles, Hyundai Motor has created the BlueDrive strategy. Here’s how it works. BlueDrive is the philosophy of Hyundai Motor, but what exactly does this philosophy entail? Quite simply, it is the company’s ambition to lead the pollution-free mobility era by improving fuel efficiency and seeking new energy possibilities. Cars that do not require any fossil fuel to operate and emit zero CO2 are the ultimate goal of Hyundai’s BlueDrive strategy. More specifically, the strategy aims to improve the functionality of automobiles such as performance, safety and convenience while reducing pollution and fuel consumption. Hyundai wants to pass on a beautiful environment for the next generation to breathe in clean air and enjoy driving cars without having to worry about fuel efficiency and clean air. Its vision for the future of eco mobility is based around the offer of four green technologies that can cater for different people’s needs: Hybrid Electric Vehicle (HEV); Plug-in Hybrid Electric Vehicle (PHEV), which can be charged using grid electricity; zero emissions battery Electric Vehicle (EV) and Fuel Cell Electric Vehicle (FCEV). HEV combines two power sources of an internal combustion engine and an electric motor. As Hyundai’s innovative development of parallel hybrids achieve better fuel economy with improved packaging efficiency, the Hybrid Starter Generator control technology further assists the engine clutch control and reduces the tension between the EV mode and the engine mode for smoother hybrid driving. PHEV is an advanced hybrid vehicle with extended battery life and greater energy density, making it more fuel-efficient and providing greater range in all-electric mode. Whether driven on EV mode or HEV mode, PHEV has a significant advantage of providing greater driving performance while reducing levels of emissions by restoring the energy from an external electric power source. EV uses an electric motor and a rechargeable high-density battery for propulsion. Powered from an external source of electricity, EV helps reduce carbon emissions. Equipped with a 28kWh lithium ion battery pack, Hyundai’s IONIQ Electric EV provides optimized solutions for better performance, higher energy density and speed. By combining hydrogen and oxygen atoms in a fuel cell stack, FCEV stores compressed hydrogen under high pressure in tanks and produces its own electricity for power with zero exhaust emissions. As the first developer of world’s first mass-produced fuel-cell vehicles, Hyundai continues to lead the future of sustainable motoring technology. Speaking at IAA 2017 in Frankfurt, Hyung Cheong Kim, president and CEO, Hyundai Motor Europe, and Thomas A. Schmid, senior vice president and COO of Hyundai Motor Europe, set out the company’s eco mobility strategy over the next three years. By 2020, Hyundai plans to launch 15 new eco models globally, including EV, HEV and FCEV vehicles to match its customers’ lifestyles. 10 of these models will come to Europe, meaning that 60 per cent of Hyundai’s line up will be available as eco cars, and this technology will be more affordable and look more appealing than ever. Part of this plan includes the launch of Hyundai’s next-generation Fuel Cell electric SUV in Spring 2018. Featuring the most advanced fuel cell technology in the industry, it will have a range of 750 kilometres. Hyundai’s next pure electric vehicle will be the KONA electric, merging the two hottest trends in the automotive market: SUV and EVs. It will launch at the Geneva motor show next year. Hyundai is also developing a dedicated EV architecture to produce multiple models with longer driving ranges. In the coming years, Hyundai will launch its newest generation of gasoline powertrains, named Smart Stream. With Smart Stream, Hyundai aims to be a leader in fuel efficiency and cleaner dynamic performance. 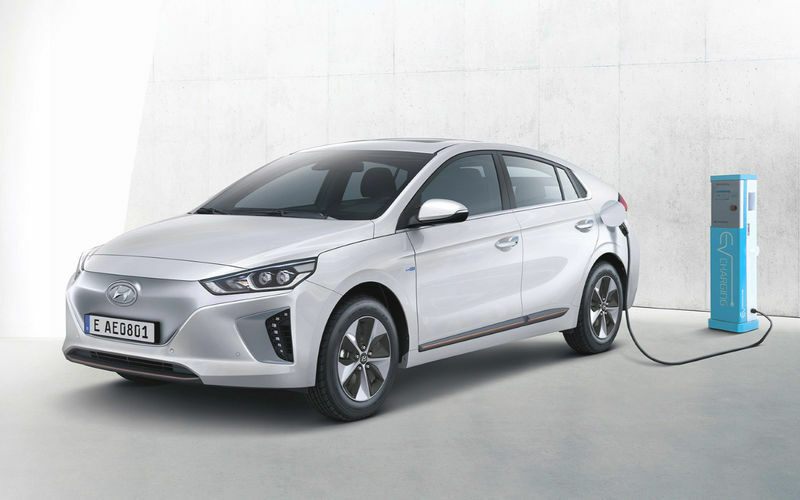 And now more than 15,000 European customers are driving IONIQ, Hyundai’s innovative eco car, while in October Hyundai starts its first electric car sharing program in Amsterdam, offering 100 IONIQ Electric zero-emission vehicles for even more people.